As we know Christ more and grow in conformity to him, the Spirit makes known the Father to us by communicating his love to us more and more. We come to share ever more deeply in the Son’s relationship with the Father in the Spirit. We know the Father by sharing in the Son’s relationship with Him. The Son comprehends the Father completely, glorifies him perfectly in eternity and so knows and enjoys him fully in unity of the Spirit. We comprehend the Father only as we come to know the Son, we glorify him by our growing obedience and know and enjoy him more and more by the Spirit who increasingly pours God’s love into our hearts. (Luke 10:38-42) Like Martha, the challenge to growth and obedience can overwhelm us, we don’t know where to start. We feel condemned and condemn others as a result. But the Son and the Spirit lead us graciously into a righteousness that comes by faith. Don’t be condemned, listen to the Lord. What one things is necessary for you to grow right now? In a similar fashion we share in that relationship with the Father in the Spirit, but there are differences: Firstly we are not eternal, nor are we God, so we cannot comprehend the Father completely, but only through what is revealed in Christ. Thus our knowledge of him is limited, but can grow over time. Secondly, the Son glorifies the Father perfectly and completely in eternity, but we can only glorify him based on what we know by obeying the word of Christ. As we do the Holy Spirit makes known to us the love of the Father. As his love is poured into our hearts we know him more, know Christ more, can obey more and so on and so forth. Thus, we come to the Father, through Christ, in (or “by”) the Spirit. We can picture this as a cup: the bottom of the cup is our knowledge of Christ, the more we know the bigger it is; our obedience is the sides of the cup, the more we obey the taller it is; as we know and obey Christ, the Spirit fills us more and we come to know the Father more. We can use another analogy, the Father loves us unchangingly, but the nature of that love changes over time as we grow in him, and our understanding of that love changes too. A parent loves their baby and their 10 year old equally but differently. The two children know and experience that love in different ways: the first very simply, the second with much more complexity and understanding. So it is with us, as we obey Christ we grow and know the Father more through experiencing the knowledge of his love in new ways. We may start with simple rejoicing and repentance when we first come to faith, but that should grow into deeper obedience from the heart, service, worship, understanding and so on. As our lives are shaped by the Word the Spirit dwells in us more richly, making the Father’s love known to us in deeper and more complex ways. The goal of the Christian life then is conformity to Christ, or – to put it more simply – to put into practice what we know of Christ and thus to know, glorify and enjoy the Father more. We can share his relationship to such an extent that Jesus describes us doing the works that he did, (vs 12) and praying and receiving whatever we ask for. To pray in Christ’s name is to know God so well that we know that what we ask for is in line with his will. This is why we can also talk of the prayer of faith or the prayer of a righteous person being particularly powerful. But conformity to Christ does not mean we are all clones. Firstly, we are all free. Obedience doesn’t mean following a regimented chain of command but understanding and obeying in freedom ( we might even say, “with creativity”.) It is this freedom that delights the Father and makes us who we are! Secondly, we are different, in personality, experience and spiritual gifting. That means that we serve him differently and thus are filled with the Spirit differently and know the Father in different ways to each other. So while we should all have the fruit of the Spirit in common, we should realise that there are many kinds of service to our one Lord (1 Cor. 12:4-6). This is why Jesus said that we will do greater works than he did in his ministry. Although this can mean literally greater miracles, in the broadest sense it means that God is glorified more through the diversity in his Church than by us each of us doing the same things as Jesus. So, yes, some do work miracles (1 Cor. 12:28-29), but each of us is capable of knowing and glorifying God in ways that Jesus did not: through work, or family life, or composing music or evangelising or whatever God has called you to! It is not as individuals that we fully know and reflect Christ’s glory, but as a Church. (Eph 3:10-11) This means that only through unity can we serve Christ fully and so experience the fullness of the Spirit and know the Father. (Eph. 2:21-22) The need for unity so that the Spirit can work is particularly displayed in the laying on of hands which establishes the need for people to come together in order to share the gift of the Spirit rather than to rely on individualistic experiences. 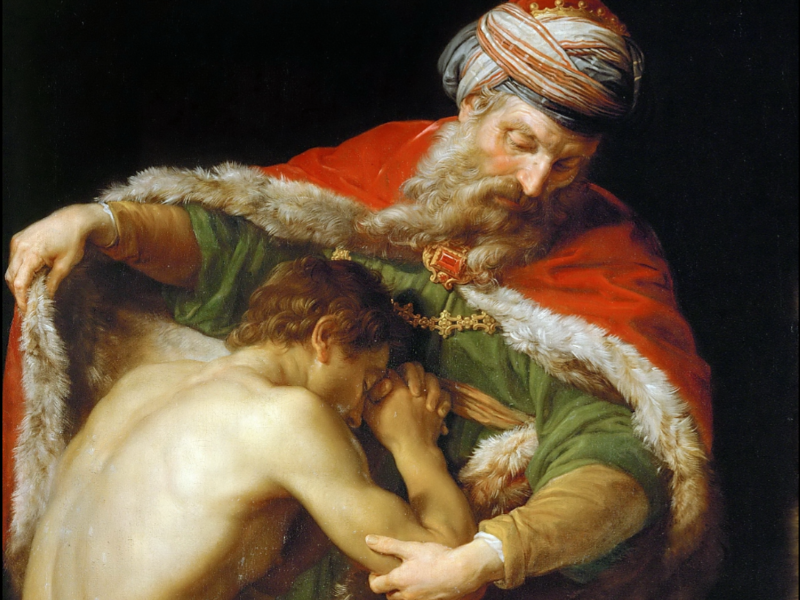 Together these things show us something of what it means to know God as Father. He is our Father because: 1. We grow to be like him, loving what he loves and as he loves and delighting in him more. 2. He is eternal, there is never an end to knowing him and enjoying him more, thus, like children, we will always be growing to be like him. 3. We share in the same life by the Spirit, whom he breathed into us and who makes him known to us. 4. We are not exactly the same, we are our own persons, so while we are one with him we are not absorbed into him 4. We are all one family related to him through the Son and in the Spirit. 3. (Luke 10:38-42) Like Martha, the challenge to growth and obedience can overwhelm us, we don’t know where to start. We feel condemned and condemn others as a result. But the Son and the Spirit lead us graciously into a righteousness that comes by faith. Don’t be condemned, listen to the Lord. What one things is necessary for you to grow right now?